Union Public Service Commission CDS Result 2019 - Government Jobs, Sarkari Naukri, Sarkari Result, Admissions, Rojgar, Exams Alerts. 1. 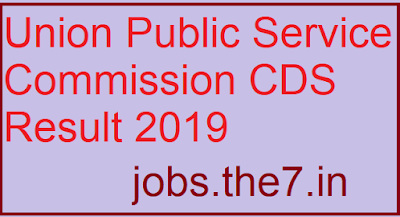 In order to download their UPSC CDS I Result 2019 candidates are required to go to the important link section provided below. 2. After getting the link candidates need to click it for downloading their UPSC CDS I Result 2019. 4. Candidates can also download their UPSC CDS I Result 2019 from official site of the UPSC. Union Public Service Commission has recently conducted the Examination of CDS I Result 2019. It was scheduled on 03-February-2019. There are total 417 posts for which Exam will be conducted. It is hereby informed that UPSC CDS I Result 2019 has released now, Result List has been displayed on the portal; they are required to check their details in the list. For Indian Military Academy, Indian Naval Academy & others defence academies hiring will be done by this Examination & various dignified defence academies over the country they will commence their Courses by this selection & Recruitment procedure. Selected candidates.